Planning to buy $gold in March for mid term. And carefully trade long $EURUSD for short term. The gold finished purple .5 as an ending diagonal, and now seems to going down towards $1077 (or purple .C) drawing a zigzag. 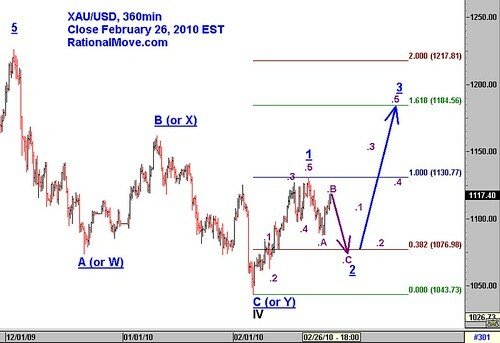 My usual plan is to buy after the end of the Wave 2 of the 1 lesser degree that is purple .2 in the chart, so it might be around the second or third week of March. I will risk 2% of the capital (meaning, the loss amount is less than 2% of the capital if the stop loss triggers) on this trade and expect 10+% return. Now I have to warn you that my EURUSD chart looks really busy. My news is mixed: The good news is the black C low was above .E (1.3440) line as I was observing this carefully. The other good news is black 1 (noted as “leading diagonal” in the chart) penetrated the blue trend line resistance. 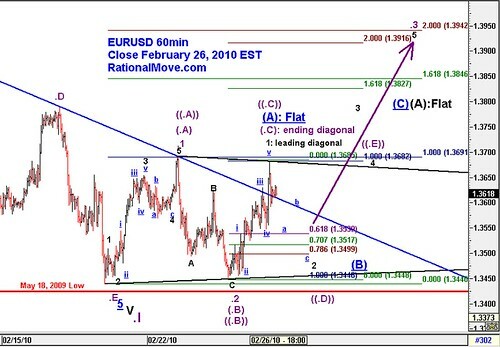 It is showing EURUSD’s potential strength in coming weeks. It’s not quite bad but not-so-good news is black 1 ended as “leading diagonal” and not impulse. If it was an impulse, I would be much more bullish on EURUSD. But since it is not, I have to keep waiting with patience. My top scenario is still the EURUSD bull, and sending the price to purple .3 level, but I have 2nd and 3rd scenario that made this chart so busy with labels. The labels of the second scenario is shown with parentheses. Starting from 1.3440 (.E), the second scenario traces purple (.A), (.B), and (.C), concluding the blue underlined (A) as a flat wave. In this scenario, I am anticipating blue underlined (B) followed by a potential impulse of blue underlined (C). The third scenario, shown with labels with double parentheses also traces purple ((.A)), ((.B)), ((.C)), but anticipates ((.D)) followed by ascending ((.E)) forming a triangle wave that stops much lower than 1st and 2nd scenario, rejected by the resistance shown with black line around 1.3675. It may be confusing to see 3 scenarios, but either ones, I will be trading along uptrend purple .3 for the 1st scenario, blue underlined (C) for the 2nd, and purple ((.E)) for the 3rd. The worst of all is 3rd, but I can still anticipate descent 100+pips gain. So, when I enter this trade, aiming right after blue underlined c (or lower 1.35′s), I will divide my position into 3 or 4 and take profit at each resistance line. I will leave one unit until the trend really turns to South. 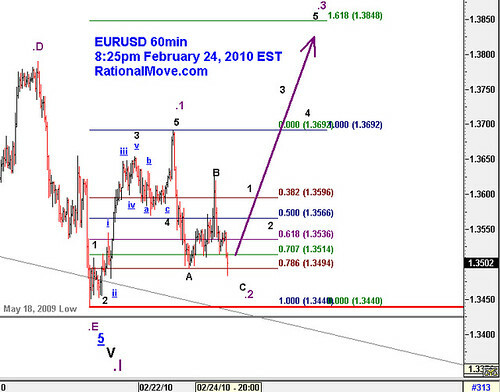 $EURUSD My count hasn’t been changed, but watching if 1.3440 holds. My count hasn’t been changed, but watching if 1.3440 holds, and I am patiently waiting Black 2 as I wrote in the previous post. 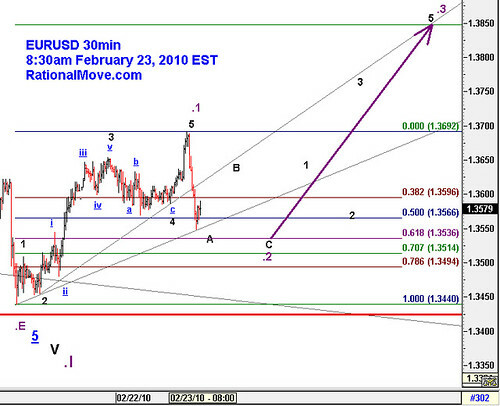 If EURUSD breaks down 1.3440, I will need to re-count the wave, and may flip to short term bearish. But I am short-term bullish as long as this support holds. Below is updated version with slightly more details from my initial anticipation. As I tweeted, I am waiting for black 2 before bidding EURUSD.